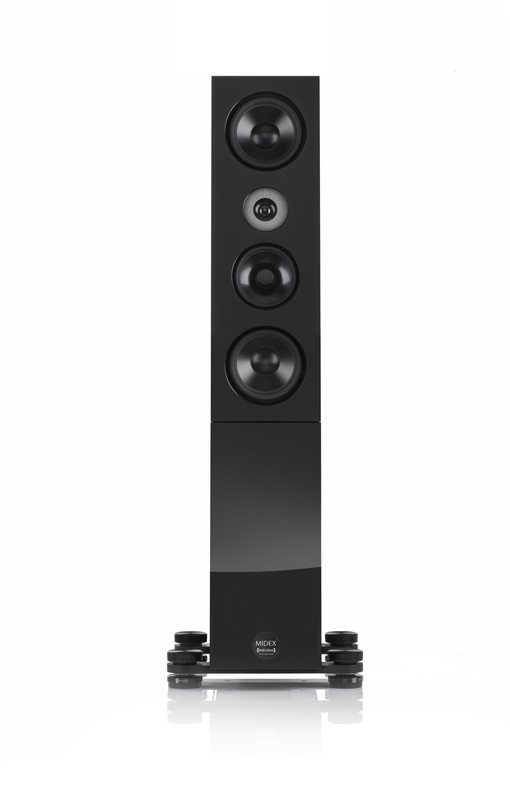 On first sight, our new MIDEX seems to follow the purist school of speaker design but it boasts a host of innovative AUDIO PHYSIC technologies. Take the position of the woofers, for instance. Instead of placing them next to each other below the tweeter and the midrange driver, they flank the other drivers, with one woofer on the top, the other at the bottom of the baffle. This placement helps avoid uncontrolled effects of room acoustics in the bass region, enhancing low-frequency fidelity significantly. The MIDEX’s cabinet uses our tried-and-tested Sandwich Construction, and has an internal reinforcement structure made from open cell Ceramic Foam. This very expensive high-tech material is unique in that it consists mostly of air, surrounded by a network of a ceramic that’s nearly as hard as diamond. Ceramic Foam is very light, but extremely stiff and strong. By using Ceramic Foam for reinforcement, we can create a very stiff cabinet without wasting internal volume, compared to using conventional materials. This means that the MIDEX is acoustically a lot larger than its outside dimensions suggest. In its internal structure, the MIDEX also features a new Honeycomb Sandwich Board, a material that we have first used in our flagship speaker STRUCTURE. At a fraction of the weight, this material is very light and rigid and a lot better in avoiding unwanted vibrations and resonances than the commonly used MDF, thus further optimising the acoustically relevant volume of the cabinet. Other pioneering AUDIO PHYSIC technologies featured in the MIDEX include the unique dampening of the cross-over network and the connection terminal. The latter, like on all our speakers, is equipped with high-end nextgen® connectors by WBT. Easy installation and sure footing on any surface are ensured by the same robust traverse setup that we use on our CODEX speaker. Equipped with standard M8 threads, this can easily be upgraded with AUDIO PHYSIC VCF II Magnetic Vibration Control Feet. These feet noticeably improve audio fidelity, reproduction authenticity and protect sensitive floors from scratches. We have designed the new MIDEX to provide unimpeachable sound quality with any kind of music and in any room, and you will not even have to compromise when it comes to looks, as it is available in a range of wood and high-gloss glass finishes as standard, and with glass panels of almost any colour on request. Height 1120 mm / 44"
Width 202 mm / 8.0"
Depth 340 mm / 13.4"
Required Space Width x Depth 202 x 340 mm / 8.0 x 13.4"
Many AUDIO PHYSIC Core Technologies have been combined to build the HHCM-III midrange driver. Together, they serve a single purpose: To guarantee an authentic rendition of the music, unaffected by any unwanted vibrations. Many AUDIO PHYSIC Core Technologies have been combined to build the HHCM-III tweeter. Together, they serve a single purpose: To guarantee an authentic rendition of the music, unaffected by any unwanted vibrations. ACTIVE CONE DAMPING is a unique design to reduce resonances in metal diaphragms, developed exclusively by AUDIO PHYSIC. Most our speakers have a regular single-wiring terminal to avoid unnecessary metal or wire bridges that would harm sound quality when used in single-wiring configuration (Which is what most Hi-Fi fans actually use). However, an optional Bi-Wiring/Bi-Amping Terminal can usually be ordered with any new speaker. Retrofitting only on special request. By coating a conical aluminium diaphragm with a special ceramic material, AUDIO PHYSIC creates a diaphragm that is at the same time very light as well as extremely rigid. When used together with ACTIVE CONE DAMPING technology the cone diaphragm is virtually immune against any partial oscillations that would otherwise impair the sound. Unwanted vibrations have negative effects on sound quality wherever they occur in the signal path. Because AUDIO PHYSIC has made it their mission to fight unwanted vibration and resonance whenever and wherever they occur, the fully decoupled VIBRATION CONTROL TERMINAL (VCT) has been devised.